Not always. It does have to have an engine and be tow-able. It varies from state to state and depends upon the year, make, and model of the vehicle. Sometimes, if the cost to transport a vehicle will cost more than what it will bring at auction, it may be declined. Call our toll free line to find out if your vehicle qualifies 877-411-3662. You must obtain the title prior to donating it. Contact your local DMV to obtain a duplicate title. In California, we can provide you with a duplicate title form. * In some states we are able to provide a duplicate title at the expense of the nonprofit or charity you are donating to. It is always best to get your title paper sorted out prior to donating, optimizing the donation for your charity. Our driver will instruct you of the proper place to sign your title. You may have to sign a power of attorney authorizing us to transfer it. Our driver will let you know what is required or call our toll free number (car phone line) to speak our representative. Our tow truck drivers are not title specialist, please consult your local DMV office to obtain information on how to sign your title correctly. You will receive a tow receipt when the vehicle is picked up. Within 4-6 weeks after your vehicle is picked up, you will receive an acknowledgement (if there are title and paper work issues with the vehicle this may take more than 4-6 weeks.). If your vehicle sells for OVER $500, you will receive IRS Form 1098 C (Copy B, Social Security Number will be required to obtain this form.). How much can I write off for my donation? If the value of the vehicle is over $500, the taxpayer is limited to deduct the amount for which the vehicle sold. In such a case you will receive a Form 1098 C (Copy B, Social Security Number will be required to obtain this form.) after 30 days of sale date. If the vehicle sells for under $500 you will not receive IRS forms as you are not required to file them. Please consult your tax adviser to determine your benefit or for additional information, (visit the IRS website). Yes. If the vehicle sells for over $500, you will receive IRS Form 1098 C (Copy B, Social Security Number will be required to obtain this form.). If not, you will simply receive an acknowledgement as required by the IRS. Vehicles are picked up at a time that is convenient for you. 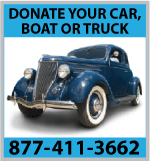 Our representative will take all pertinent information regarding your donation and forward it to our tow company. They will call you within 24 hours to set up an appointment. If you have not been called within 24 hours, please call 877-411-3662. We take cars, boats on a trailer, motor homes, trucks, operational motorcycles, farm equipment, and recreational vehicles such as snowmobiles, jet skis, etc. Call our representative to find out if your vehicle qualifies. * Please note that boats, trailers and large/odd donations are taken on a case by case basis. Please call for more information 1-877-411-3662.
. . . and the most important reason is that your donation supports 91.9 KRVM and helps “Keep Real Variety in Music”!